With the interest in Saturn and Titan due the Cassini and Huygens missions it was fortuitous that I read this book. If you are at all interested in SF it makes a compelling read. It begins in 2008 or there about with a returning Shuttle suffering a serious re entry accident (familiar story!!) NASA is in decline and there are various ecological and political problems in the USA and around the world. 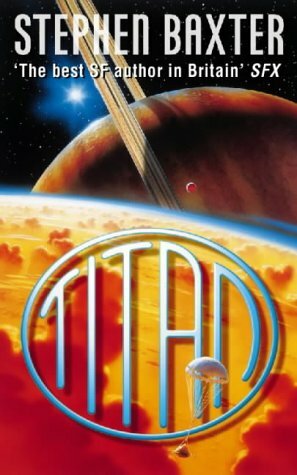 The book revolves around the decline of NASA and the manned shot to Titan is a last gasp mission that is put together on a shoe string using refurbished old and or mothballed equipment, that this equipment exists is true - that it could be brought back into service is highly questionable BUT then it is only a story. After wrangling between NASA and the USAF the mission begins but the air force try to shoot it down doing a little damage. However it gets into space and again follows a similar route to Cassini. It is a book about the science of space travel and human relationships with a little politicking thrown in. Having mentioned some of the plot I am going to say no more other than it has a surprising ending in more ways than one and perhaps that was the reason the book was written. It is one of the best new reads in the SF field that I have had over the past few years and for those interested in this area is well worth looking out for. It puts together many ideas, is scientifically correct as far as any SF book goes in that it takes real fact and then embroiders and stretches it, sometimes a little sometimes a huge amount, and is a real page turner of a book.